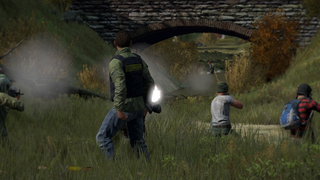 Dean Hall, the lead developer behind hit multiplayer game DayZ, is leaving studio Bohemia Interactive. Hall plans to create his own studio in his native New Zealand. Hall told Eurogamer that he never intended to be at Bohemia Interactive's Prague office and originally wanted to stay in his home country. "And it's kind of like cooking in someone else's kitchen: I don't want to be constantly telling Bohemia that this is how I do it and this is the way we do it," he added. That doesn't mean he's going to leave DayZ hanging. "I would extend my involvement here as long as Bohemia wanted—needed—me," he explained. "Originally I wasn't going to do this year, but it would be stupid not to, and it would be unfair to the community. I have to be on the project as long as it's important to. Whether that role is as the leader, whether that role is in a more creative sense... But at a certain point there will be diminishing returns. "I'll be always involved," he said, but stated that he will move on by the end of the year and start building his own studio—a process he thinks will take "years." We wish him luck. UPDATE: On Reddit, Hall reiterated his commitment to working on DayZ as long as need be: "the most important element of the story is that I am continuing to work on DayZ for the rest of the year, and more if required."